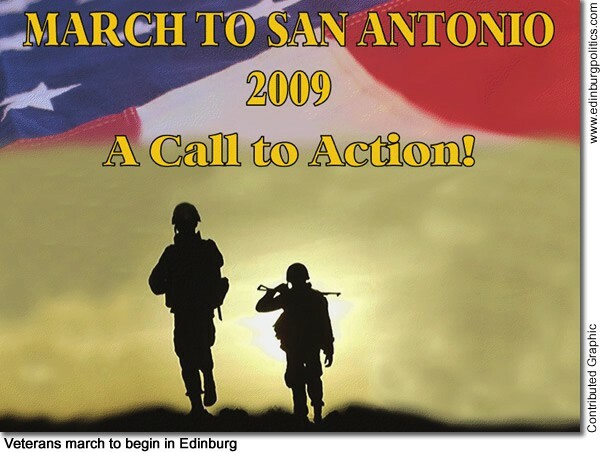 Area leaders are calling on South Texans to join Valley veterans in Edinburg on Saturday, March 14, to help kick off a march to San Antonio designed to continue rallying support for a Veterans Affairs Hospital for deep South Texas. The march, which will include Rep. Aaron Peña, D-Edinburg, and Rep. Ismael "Kino" Flores, D-Palmview, will begin at 9 a.m. at the Sekula Memorial Library, 1906 S. Closner Boulevard, in Edinburg. The march will end on Friday, March 20, at the Audie Murphy Memorial VA Hospital, 7400 Merton Minter Street, in San Antonio. For more information, residents may contact Jesús Bocanegra at 956/246-8342 or Rey Leal at 949/292-7185. 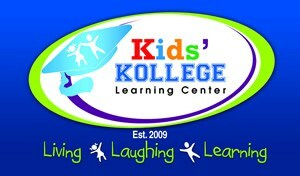 For sponsorship, persons may contact Chris Treviño at 956/720-2381. Edinburg Home Buyers Expo organizational and planning committee will address the Edinburg City Council on Tuesday, March 3, with an update on the 2nd Annual Edinburg Home Buyers Expo, scheduled for Saturday, April 18, at the ECHO Hotel. The committee’s main goal is to educate and inform Edinburg residents and others interested about many topics regarding the housing market. “This is an opportune time to invest in real estate. If you are one who has been saving and waiting to grab a good deal, the time is now," said Edna Peña, realtor with Horizon Properties. Featured, from left: Verónica Guerrero, City of Edinburg; Edna Peña, Horizon Properties; Elva Jackson Garza, Edwards Abstract and Title Co. and Expo Chair; Flo Prater, Rio Valley Realty; Marty Martin, Rio Valley Realty; Michelle Mendoza, County of Hidalgo; Steve de la Garza, County of Hidalgo; Anna L. Casares, International Bank of Commerce; María (Charo) Mann, Southwest Community Investment Corporation Women’s Business Center; Letty Reyes, Edinburg Economic Development Corporation; and Irene Del Toro, Texas Valley Communities Foundation. See story later in this posting. The Edinburg Chamber of Commerce along with the Edinburg Convention and Visitors Bureau will host the 3rd Annual Community Health Fair & Edinburg on Wheels, Saturday, March 7 from 8 a.m until noon. The event will be held at the Edinburg Chamber of Commerce, 602 W. University Drive. The Health Fair is currently accepting participants. Booth entries cost $75 for non-profit organizations, $100 for chamber members or $150 for future chamber members. All businesses and organizations in the health and medical field are encouraged to participate. The Edinburg on Wheels is a six-mile bike ride along Edinburg’s “Hike & Bike” trails, promoting health and wellness for people of all ages. Bike ride registration will be from 8 – 8:45 a.m., and the ride begins promptly at 9 a.m. T-shirts for the first 100 registrants will be given out for free. Snacks, water and drinks will also be provided. Families are greatly encouraged to participate. The event is sponsored by Stonebridge Injury Accident Clinic. For more information, please call the Edinburg Chamber of Commerce at 956/383-4974. 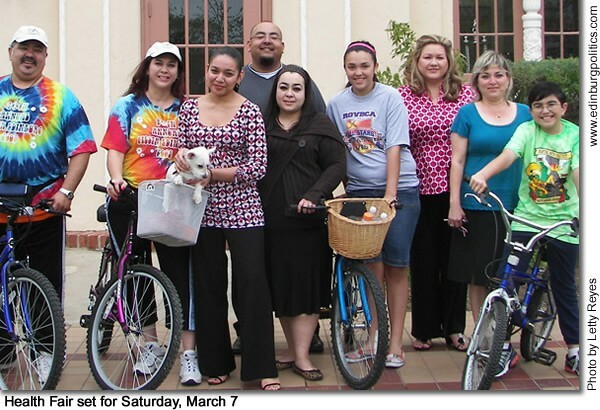 Featured, promoting the event, are, from left: Johnny Rodríguez, Melissa Rodríguez, Cristal Cavazos, Frank Lara, Evana Vleck, Kimberly Rodríguez, Imelda Rodríguez, Letty González, and John Paul Rodríguez. South Texas College and The University of Texas-Pan American have developed the Start Here, Finish There Student Transfer Success Action Plan to ensure students have an easier time completing their degrees through a partnership between both higher education institutions. “The plan includes strategies to develop a seamless transition for STC graduates transferring to UTPA,” said Juan E. Mejia, STC vice president for academic affairs. 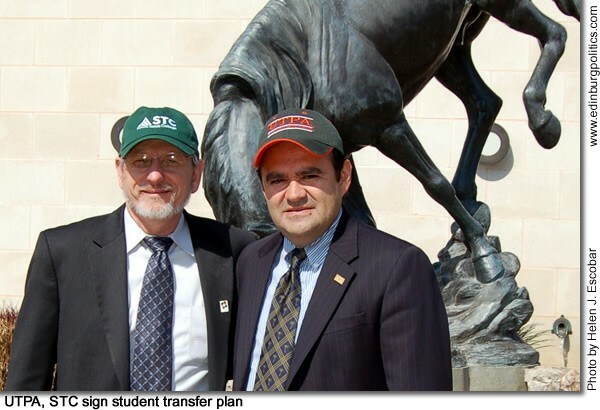 “The more than 25 strategies included in the plan have clear timelines for implementation and accountability for completion.” Featured, from left at the UTPA campus, are: Dr. Paul Sale, UTPA provost and vice president for academic affairs, sporting an STC cap and Mejia, wearing a UTPA cap to symbolize a deepening partnership between the two higher ed institutions. See story later in this posting. 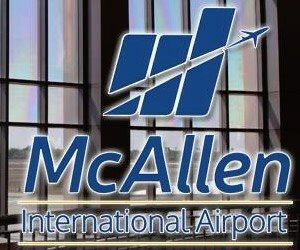 A planned $14 million Edinburg Medical Conference Center, envisioned by McAllen construction magnate Alonzo Cantú, continues on an apparent fast-track on Tuesday, March 3, when the Edinburg City Council will consider recommending that proposed facility and a recently completed medical tower for state tax incentives. Both structures are part of the sprawling Doctors Hospital and Renaissance complex, located in southwest Edinburg. Cantú, whose development company built the hospital system, also serves on the board of directors for Doctors Hospital at Renaissance. Cantú is asking the Edinburg City Council to approve designating those two facilities as state enterprise zone projects, which could qualify DHR for up to $750,000 in economic incentives from the state government. 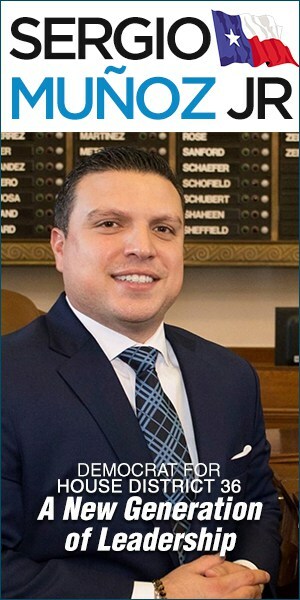 "An enterprise zone is an economic development tool that allows a community to partner with the state to offer a package of local and state tax and regulatory benefits to new or expanding businesses in economically-distressed areas," said Ramiro Garza, Jr., executive director for the Edinburg Economic Development Corporation. 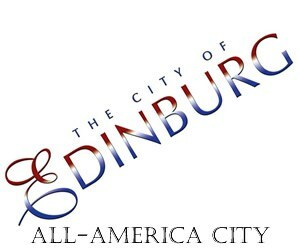 "This designation will not be at any cost to the City of Edinburg nor will the city lose sales taxes. The city will benefit with the increase in the tax base and the creation of new jobs." According to Garza, the two projects will represent an investment by DHR of about $50 million and create about 300 additional jobs. Whether the city provides any local incentives remains to be seen. According to the governor’s office, local communities must offer incentives to participants under the Enterprise Zone Program, such as tax abatement, tax increment financing and one-stop permitting. But before Cantú or DHS can get the coveted enterprise zone status – and the final approval for state incentives must come from an agency controlled by Gov. Rick Perry – the city council must hold a public hearing. That hearing is set during the first portion of the city council’s session regular bi-monthly meeting, which begins at 7 p.m. The meeting will be held at Edinburg City Hall. If the two projects receive the designation, it would be the second time the hospital system has been recommended by the city council for enterprise zone status. "DHR has surpassed the amount of qualified credits under the current Enterprise Zone designation due to this expansion and development," Garza noted, explaining the need to again seek the enterprise zone status for consideration by Perry. 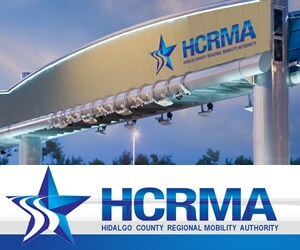 DHR was first designated as an enterprise zone in 2005, according to Garza, noting that the medical system’s expansions since then have resulted in the creation of more than 1,000 full-time jobs and more than 200 part-time jobs, representing an annual payroll of $45,000. Those new jobs were the result of the construction of a women’s hospital, a cancer treatment center, a behavioral health center, and other medical facilities. Under state law – created in the 1980s by then Rep. Juan "Chuy" Hinojosa, D-McAllen – the proposed medical conference center and medical tower would be eligible to apply for state sales and use tax refunds on qualified expenditures. The level and amount of refund is related to the capital investment and jobs created at the qualified business site. According to the Texas Comptroller of Public Accounts, the state law limits allocations to the state and local communities per biennium. The state accepts applications quarterly with deadlines on the first working day of March, June, September and December. On Tuesday, February 24, Cantú for the first time publicly unveiled plans by Doctors Hospital at Renaissance (DHR) to build the $14 million Edinburg Medical Conference Center and a 100-room hotel as part of his vision to expand medical education and resources in the three-time All-America City. No local sales tax breaks for the project were recommended by the EEDC board of directors. Cantú attended the session, but did not speak, instead allowing Warren to make the formal presentation, along with Susan Turley, chief financial officer for DHR. But Cantú noted that the development of the planned hotel – which would represent an additional investment by DHR of between $5 million and $10 million – could hang on the fate of the medical conference center. The proposed medical conference center would be feature an auditorium with a performance arts capability, conference rooms, a board room, a catering kitchen facility, according to the project architect. This is a significant project being proposed. How did this idea come about? We have the need for something like this. We have meetings once a month at Embassy Suites, and it wasn’t good. Then, we started bring more doctors to come for presentations, and do some CME’s (continuing medical education) courses for the doctors, so we have been certified as a CME center, so that is going to help out. The plan calls for the use of high-technology video and audio technologies. Is that so you would be able to show medical professionals how surgeries are conducted with these technologies, or would you have actual surgeries at the conference center? The surgeries would be at the hospital. Our plan would be – when we bring out-of-town doctors to provide CME courses – to film and broadcast those courses, either through local government channels, such as the City of Edinburg, or perhaps get our own TV cable channel, a health broadcast network, and feature presentations, training for employees, and provide medical education for the public. Earlier today (Tuesday, February 24), we had a meeting with the UT Health Science Center’s cancer center representatives. They want to come here, and we will probably be a site for (cancer) research through them. One of the things we want to do is help educate the public, make the community aware of the first signs of cancer. We are going to be doing a lot of that. Are there any other similar concepts in South Texas? I don’t believe so. We just want to be a full-service health center here, and provide all the services that are needed to deliver state-of-the-art technology. It would also give us credibility with some of the big science centers in the state, such as the University of Texas Health Science Center Medical Branch in Galveston, to bring some of their doctors come down here, not only to do procedures, but also to work with some of our physicians. How would this project help current legislative efforts to bring a UT medical school to the Valley? We would have the infrastructure in place, we would have the credibility, plus we would have doctors who are teaching at other hospitals who would see we do have the state-of-the-art equipment and technology. So, if a medical school was started, we would be ready to have some of the medical students training here. There are also plans for a hotel. The $14 million investment mentioned earlier in the presentation before the Edinburg Economic Development Corporation board of directors, is that just for the medical conference center, or does that also include the cost to build the hotel? Also, what is the timetable for the conference center and the hotel? It depends on how it goes with the conference center. We would probably work on getting a study as to what kind of hotel would be needed — probably an extended stay hotel because the patients who come in will be here a few days. Our consultants would tell us what kind of hotel would be needed – probably a 100-room hotel. What is the projected start date for proposed conference center? It depends on what kind of cooperation we get from the city, from the EEDC, and the medical foundation (Edinburg Community Health-Medical Care Advisory Committee, more commonly known as the city’s Medical Advisory Board). We would like to do it as soon as possible. If those partnerships come about, how long would it take for the conference center to go from groundbreaking to grand opening? Once we get the plans filed, I would say about nine months or less. How about construction costs estimates for the proposed hotel? Probably about $5 million to $10 million, depending on how elaborate it is. Are there any points I missed in my questions which you feel are important for the public to know? It is important that the Valley is recognized as a health center, such as San Antonio, so people don’t have to go to San Antonio, Houston, or Corpus Christi. We will be able to provide those medical cases, surgeries, here. We have a state-of-the-art cancer center here, and many people are not aware of that, or of the sub-specialists who we are bringing down from San Antonio, Houston, or Galveston to perform cases here. This way, instead of our families being displaced and going up there, their doctors are coming down here because we have technology, the equipment, and the staff they are looking for. The Texas Department of Transportation (TxDOT) is recommending that $114.5 million of improvements along U.S. Highway 281 be funded with a combination of federal stimulus package money and other funds. Hidalgo County leaders first received the announcement that TxDOT was committing to funding a majority of the proposed U.S. 281 improvements during their legislative trip to Austin on Feb. 10-11. The transportation department has now included the projects as part of its "agency recommended stimulus projects," confirming the commitment to improving the corridor. Hidalgo County leaders, area economic development representatives, mayors, and state legislators — especially Sen. Juan “Chuy” Hinojosa — have lobbied hard for these improvements over the past several years. The U.S. 281 Coalition, which is composed of elected officials and business interests from locales all along the corridor, was formed in 2007. Hidalgo County Judge J.D. Salinas leads that effort. "There’s nothing like seeing your project on paper," he said. "We have been told that construction on the first U.S. 281 improvement should begin in Falfurrias by this fall. It’s a blessing to finally have made progress on an issue that affects us all. U.S. Hwy 281 is the third busiest NAFTA corridor in Texas, and traffic is expected to double by 2030." Upgrades to the highway have been proposed at Falfurrias, Premont, Ben Bolt and George West. "By beginning to bring U.S. Hwy 281 up to interstate standards, we will make Hidalgo County more attractive to business, create 1,500 jobs in the region and ensure the safety of our residents in case of an evacuation," Salinas said. TxDOT is expected to meet March 5 in Austin for a special meeting in which they will vote on $1.2 billion staff-recommended list of projects. They are soliciting feedback from interested individuals until then. Comments can be made through TxDOT’s website, http://www.txdot.gov, keyword "stimulus" or via fax (512-463-9896) or by email, askTXDOT@dot.state.tx.us. The proposed projects that will benefit Hidalgo County are located under Page 3 of the attached document. For more information, visit http://www.co.hidalgo.tx.us or visit Salinas on Twitter at http://www.twitter.com/hcpio, our blog at http://www.judgejd.com and the Hidalgo County Judge’s Office Facebook group. 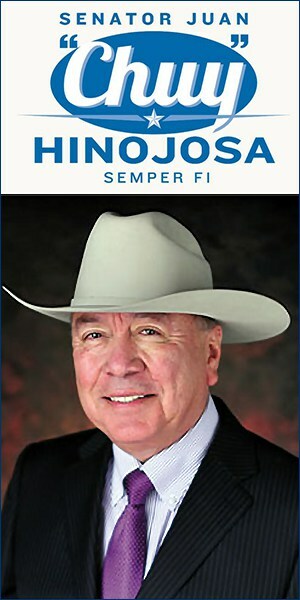 Rep. Rubén Hinojosa, D-Mercedes, on Wednesday, February 25, announced that he has secured $60 million for local projects in the omnibus spending bill that was approved by the House of Representatives. The $410 billion spending package includes critical funding for levee repair as well as the Kika de La Garza Subtropical Agricultural Center. The bill now goes to the Senate for approval. The legislation is needed to fund most of the federal government through September, when its fiscal year ends. “This bill is a huge win for the Rio Grande Valley and will provide much-needed money for important projects that have long been underfunded,” Hinojosa said. The bill contains an important $8.6 million for the Kika de La Garza Subtropical Agriculture Research Center and $1.7 million for the Honey Bee Research Weslaco Center. This funding will ensure that these centers are able to continue to operate and conduct their research work, Hinojosa said. The budget also contains $43 million in funding for the International Boundary and Water Commission (IBWC) for levee repair. This money builds on the landmark $220 million the Commission received in the recovery legislation that was signed into law earlier this month, noted Hinojosa. “I am confident that with this major influx of cash the IBWC will finally be able to finish repairing our levees,” Hinojosa said. $4 million for water conservation projects in the Valley to fund and continue work on irrigation canal lining that will more efficiently deliver irrigation water. Completed projects in Valley are showing water savings of more than 30 percent. $119,000 for Texas Mathworks in McAllen ISD to recruit and train teachers in the Mathworks model so that they can conduct summer math camps, school year math clubs and become peer mentors for other math teachers. Mathworks is a mathematics program designed to teach students mathematics at earlier ages. Mathworks outreach programs help all students excel in mathematics and include teacher-training programs. $665,000 for Mile 1 in Hidalgo County — to widen Mile 1 to four lanes from Bus 83 to Mile 8. $617,500 for Interstate 69 — to fund route studies on the construction of I-69 in Texas. The Interstate 69 corridor from Texas to Michigan is on a short list of interstate corridors being considered for fast track development by federal transportation officials. $500,000 for the Lower Rio Grande National Wildlife Refuge to enable the Fish and Wildlife Service to purchase land from willing sellers and add to the existing wildlife refuge. $285,000 for the La Feria Boys and Girls Club to facilitate the construction of a Boys and Girls Club in La Feria. $118,938 for Hidalgo County waste to energy plan to conduct a feasibility study for establishing a waste to energy plant so that less solid waste is sent to the landfill. $119,000 for Driscoll Children’s Hospital electronic medical records project to purchase equipment in order to implement the new federal electronic medical record system throughout all the Driscoll facilities. $300,000 for the Hidalgo County truancy program to provide individualized services to at-risk youth in nine school districts and to expand the program to other school districts in Hidalgo County. The program, overseen by the Hidalgo County Court System, addresses the cause of truancy and provides drug and mental health counseling, family services, and housing. Rep. Rubén Hinojosa, D-Mercedes, on Thursday, February 26, announced that the first batch of stimulus dollars is set to hit the Valley by the end of March. Edinburg will be getting about $250,000 out of the almost $5 million in funds that will be shared by seven Valley city governments. Hidalgo County will receive the largest share – almost $2.3 million. The U.S. Housing and Urban Development Department will be sending these local governments a total of $4.7 million under the stimulus package’s Community Development Block Grant program. This program enables local governments to undertake a wide range of activities intended to create suitable living environments, provide affordable housing, and create economic opportunities, primarily for persons of low and moderate income. Hinojosa said that the cities and counties in the Valley are required to give priority to projects that can award contracts based on bids within 120 days of the grant agreement. “This is truly good news for a region. Stimulus dollars will begin arriving within the next 30 days and will start to create jobs and economic opportunities in our region. I am confident that this highly effective community development program will quickly improve the overall quality of life of our residents,” Hinojosa said. “This is just the beginning of a historic influx of funding that will help create more employment and educational opportunities in the Valley. 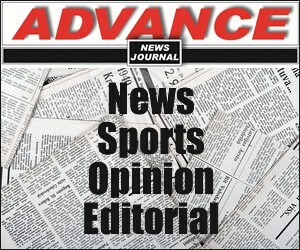 I am confident that this plan will make our local economy stronger and more competitive in the long term,” Hinojosa said. Gov. Rick Perry on Tuesday, February 24, reiterated his request that the Texas Legislature appropriate $135 million for continued border security funding to combat transnational gangs. The governor met in El Paso with Gen. Barry McCaffrey, former director of the Office of National Drug Control Policy, local leaders and law enforcement to discuss border security issues and the escalating, drug-related violence in Mexico. Texas has recently developed a contingency plan to respond to potential spillover violence from northern Mexico by working with local, state and federal law enforcement. More than 5,700 homicides occurred in Mexico in 2008, with roughly 1,600 in Juárez alone, which borders El Paso on the southern side of the Rio Grande. Already in 2009, Juárez has seen over 230 brutal homicides. The U.S. State Department estimates that more than 200 Americans have been killed in Mexico since 2004. Last year, Mexico was Texas’ top trade partner, with more than $62 billion in Texas products exported and more than $143 billion in Mexican goods imported. A porous border allows international terrorists, organized crime cartels and transnational gangs to put Texas and the nation at risk. 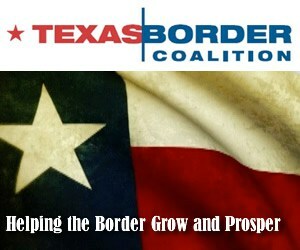 Until the federal government fulfils its responsibility to this effort, Texas needs continued leadership and funding from the Legislature to support the state’s current border security strategy, which involves putting more boots on the ground and providing increased law enforcement resources along the border. Additionally, transnational gangs such as the Mexican Mafia, Texas Syndicate, Barrio Azteca and MS-13 have begun to operate in every region of the state and are involved in extortion, retail drug distribution, vehicle theft, child prostitution, money laundering and drive-by shootings. These organizations recruit members from high schools and prisons and have become highly adaptive, increasingly using technology to thwart law enforcement efforts. To view video and photos of the event, please visit http://governor.state.tx.us/video. Lawmakers dealt with issues relating to state schools for the developmentally disabled this week, one of Gov. Rick Perry’s emergency issues for the session. A recently released US Department of Justice report found 250 incidents of abuse and neglect and 53 cases of preventable deaths at the state’s 13 state schools in 2007, prompting the emergency designation. This designation means that legislation relating to state school reform can be passed before the 60th day of session. Senators considered two such bills this during the final week of February. Sen. Jane Nelson, R-Flower Mound, who chairs the Senate Health and Human Services Committee, held a hearing Tuesday, February 24, on a bill she filed to increase oversight at Texas state schools. "The abuse and neglect that has occurred in our state schools is inexcusable," said Nelson as she presented the bill. "These are people with serious disabilities; they need our protection, they need our oversight and they need our compassion." Her bill, SB 643, would create an office of ombudsman to act as a liaison between residents and families and administration and would conduct two audits of each state school every year. The bill would require video surveillance in all state school common areas and would implement FBI fingerprint background checks for all employees. Additionally, the Department of Aging and Disability Services would be empowered to conduct random drug tests of employees. Sen. Rodney Ellis, D-Houston filed a bill that looks for a long term solution for the state schools’ woes, one that would require a comprehensive reform plan by the end of 2010. He says Texas often over institutionalizes its clients, putting people in state institutions when they could be better, and more inexpensively, cared for in community or home-based settings. Ellis’ bill, SB 1060, would direct the state Health and Human Services Commission to develop a strategy to increase the number of treatment choices and the efficiency of care for the state’s developmentally disabled. "It is about providing current residents and family members of current residents with a choice, and giving them every tool possible to be comfortable with that choice," said Ellis. The bill would also require plans to reduce waiting lists, and consolidate and eventually close some of the Texas state schools. The Senate Intergovernmental Relations Committee took a look at the state of the housing market in Texas, hearing testimony that things are not as bad here as in the rest of the country. "Relatively speaking, Texas has been doing very, very well, compared to many of the other big states and particularly to the national level," testified Dr. Jim Gaines, a research economist at Texas A&M’s Real Estate Center. Texas was one of only six states to post a slight gain in home values, he said, and during the housing bubble Texas lenders avoided more exotic loan options, like interest-only mortgages. 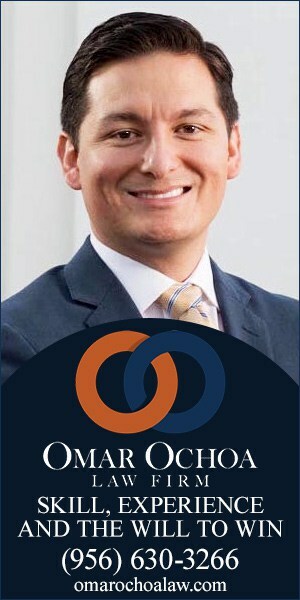 This has let the state weather the housing market collapse relatively well, but he did predict flat or even a slight decrease in home values in 2009. The Senate reconvened on Monday, March 2 at 1:30 p.m.
Gov. Rick Perry on Tuesday, February 24, announced his support for Senate Bill 182 and House Bill 36, which would require a physician to perform an obstetric ultrasound on a woman at least two hours before a scheduled abortion. The legislation requires ultrasound imaging of the embryo or fetus and an audible heart auscultation to be performed on expecting mothers in conjunction with the physician’s explanation of each procedure. The patient would also have to a sign a written statement certifying requirements are fulfilled before an abortion is performed. Perry remains committed to promoting family values and defending unborn children. He recently announced his support of House Bill 109, which would create a “Choose Life” specialty license plate to raise funds to assist pregnant women who are considering adoption as an alternative to abortion for their unborn children. In 2005, the governor signed Senate Bill 419, which requires physicians to obtain written permission from the parent or legal guardian of a minor child before performing an abortion on that child. The statute gives the Texas Medical Board the authority to enforce this requirement by imposing license violations on physicians who violate it. This law is the most stringent protection of parental rights passed in the state to date. The 2nd Annual Edinburg Home Buyers Expo will be held on Saturday, April 18 at the Echo Hotel and Conference Center from 9:30 a.m. to 3 p.m. 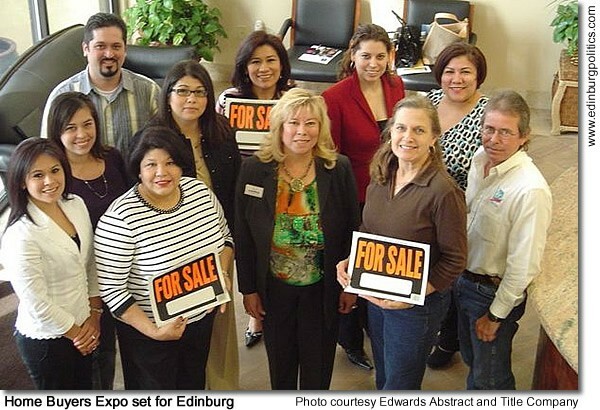 The Edinburg Home Buyers Expo committee has been meeting regularly to finalize details of the upcoming event. The committee’s main goal is to educate and inform Edinburg residents and others interested about many topics regarding the housing market. “This is an opportune time to invest in real estate. If you are one who has been saving and waiting to grab a good deal, the time is now," said Edna Peña, realtor with Horizon Properties. As many area residents have learned from the news, the real estate industry nationally is struggling. 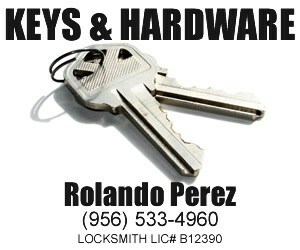 However, the Rio Grande Valley still offers many opportunities to take advantage of. “Lenders will be available to explain the qualification process, documents that are needed and other vital information that will prepare a new home owner as they begin the loan application process,” Peña added. The program and presentations include lots and property availability, mortgage prequalification, foreclosed properties, land sales and financing, loan application requirements, the loan process, consumer and credit counseling, title insurance education and buyers assistance programs that are available to local residents. The Edinburg Homebuyers Expo will offer valuable information and resources to prospective home buyers from all income levels ranging from low, middle and higher income groups. Information regarding commercial properties will also be available through the various real estate companies, developers and lenders who will be on hand throughout the day. For more information about the Edinburg Home Buyers Expo, please contact Elva Jackson Garza at 383-4951, Marty Martin at 687-7653, Edna Peña at 393-1909 or Flo Prater at 687-7653. South Texas College and The University of Texas-Pan American have developed the Start Here, Finish There Student Transfer Success Action Plan to ensure students have an easier time completing their degrees through a partnership between both higher education institutions. As an example, STC and UTPA committed to completing 2+2 articulation agreements between 30 academic programs by December 2009. Through the articulations, students will have a clear roadmap of what courses to complete at STC during their freshmen and sophomore years in college, as well as a list of the remaining courses required from UTPA during their junior and senior years, leading to the completion of a bachelor’s degree. The goal for the 2009 spring semester is the completion of ten 2+2 agreements. The first meeting between faculty teams from both STC and UTPA will be hosted at UTPA and was scheduled for February 27, 2009. Eighty professors, 40 from STC and 40 from UTPA, as well as administrators from both institutions were scheduled to iron out the first 10 articulation agreements. Another key strategy in the plan is the adoption of the Texas Common Course Numbering System by UTPA by fall 2009. The change ensures that STC and UTPA are using the exact same course numbers for all freshmen and sophomore courses in the system. The change will result in a simpler recording mechanism for portability of credits by graduates. Additionally, STC and UTPA hope to establish an STC/UTPA Pre-Admittance Program by April 2009. Under the program, qualifying STC graduates gain pre-admittance to the university. The program may encompass special financial aid opportunities, locked-in tuition rates, scholarships, as well as special student life and academic programs for pre-admit students. During the spring 2009 semester close to 40,000 students are seeking higher education degrees at STC and UTPA combined. Check each college’s Web site for updated information about the STC/UTPA Start Here, Finish There Student Transfer Success Action Plan (www.southtexascollege.edu, http://www.utpa.edu). As tough economic times grip our nation and state, small cities and non-profits are feeling the effects of the financial downturn. While many of us are hopeful federal stimulus monies will alleviate some of the burden, I want you to know I am working to find ways to offer relief to municipalities and organizations faced with tightening their budgets. It is now more important than ever that we as leaders make sure our citizens have jobs, access to health care, and that our children receive education and the opportunity to go to college. I recently attended a summit in Washington D.C., sponsored by Congressman Henry Cuellar, D-Laredo/McAllen, where numerous federal agencies presented grant opportunities that could help small cities. These grants provide a wonderful opportunity to pay for things like computers, public safety equipment such as fire trucks and even some construction projects. Other grants will cover the cost of setting up distance learning and tele-medicine centers in rural communities. Farm Service Agency loans for farmers who are not able to qualify for private resources to purchase farms, buildings, improvements, livestock, equipment ect. Community facilities loans and grants provide loans and grants for clinics, schools, Head Start centers, police and fire stations, fire trucks, city halls, homeless shelters and libraries in rural areas and towns with populations less than 20,000. Housing programs provide rural Americans and non-profit developers several loans and grant programs for a variety of housing options. Providing rural America with essential utility services help rural utilities expand and improve technology, helps establish distance learning and tele-medicine, and provides financial assistance to construct and improve energy facilities. Water and environmental programs provide direct loans to develop drinking water and wastewater systems, solid waste disposal and storm drainage in rural areas with a population of 10,000 or less. Cooperative services provide technical assistance, conducts cooperative-related research, and produces information products to promote public understanding of cooperatives. Business programs provides financial backing for rural businesses, including commercial loan guarantees available up to 80 percent of the loan amount. For more information on the above programs, contact the local USDA Rural Development field offices, at 2514 South I Road, Suite 4 Edinburg, TX 78539, (956) 383-4928, Ext. 4. 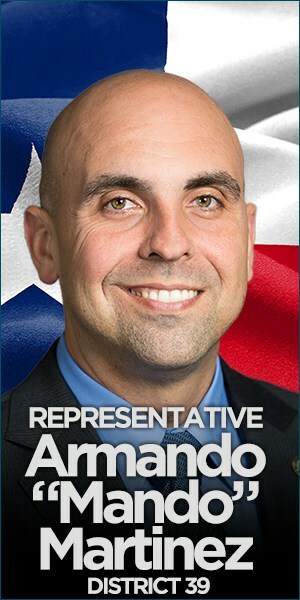 If you have questions or need assistance, please contact my office at (956) 686-5501. I will continue to look for ways to help you maximize your budget. I hope you review this information, and are able to find programs that can help you in these challenging economic times. Hearst Corporation on Tuesday, February 24, announced that its San Francisco Chronicle newspaper is undertaking critical cost-saving measures, including a significant reduction in the number of its unionized and nonunion employees. If these savings cannot be accomplished within weeks, Hearst said, the company will be forced to sell or close the newspaper. Hearst said that the San Francisco Chronicle lost more than $50 million last year and that this year’s losses to date are worse. The San Francisco Chronicle has had major losses each year since 2001. “Because of the sea change newspapers everywhere are undergoing and these dire economic times, it is essential that our management and the local union leadership work together to implement the changes necessary to bring the cost of producing the San Francisco Chronicle into line with available revenue,” said Frank A. Bennack, Jr., vice chairman and chief executive officer, Hearst Corporation, and Steven R. Swartz, president of Hearst Newspapers. Hearst noted that these cost reductions are part of a broad effort to restore the San Francisco Chronicle to financial health. The San Francisco Chronicle has been asking its readers to pay more for the product through home delivery and single-copy price increases. In June, the San Francisco Chronicle expects to begin printing on new presses owned and operated by Transcontinental Inc., which will give the San Francisco Chronicle industry-leading color reproduction capabilities. Former City of Hempstead Mayor Pro-Tem Larry Wilson and City Alderman Paris Kincade have both pleaded guilty to accepting bribes in exchange for their vote and support resulting in the awarding of city contracts, acting United States Attorney Tim Johnson announced on Thursday, February 26. 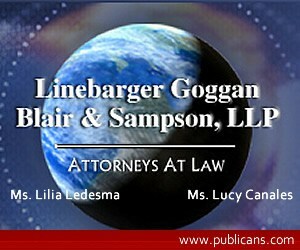 Both men pleaded guilty to conspiracy to commit federal programs fraud before the Honorable Judge Keith P. Ellison. The City of Hempstead is located approximately 50 miles west of Houston in Waller County. Wilson, 42, who entered a his guilty plea on Wednesday, Feb. 25, 2009, and Kincade, 53, who pleaded guilty on Thursday, February 27, admitted to soliciting and accepting bribe money or kickbacks from a local contractor in exchange for obtaining approved vendor status resulting in the awarding of city contracts. Beginning in December 2006, Wilson who was the Mayor Pro-Tem and a City Alderman of the City of Hempstead, and Kincade, a city alderman, conspired to use their official positions with the City of Hempstead to commit federal programs fraud. They corruptly solicited and accepted monies from a contractor, intending to be influenced and rewarded in connection with the eventual award of city contracts. A conviction for conspiring to violate federal programs fraud carries a penalty of imprisonment of not more than five years and/or a fine not to exceed $250,000. Both men remain on bond pending sentencing. Wilson will be sentenced May 14, 2009, at 10:30 a.m. and Kincade will be sentenced on May 20, 2009, at 10:30 a.m. The charges are the result of an investigation conducted by special agents of the Houston FBI. 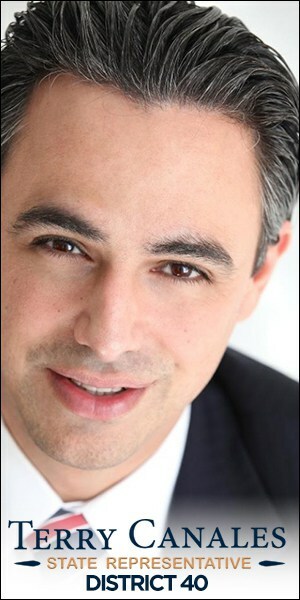 Assistant United States Attorney Michael Wright prosecuted the case. Total enrollment in spring 2009 increased slightly for Hispanic, African American and foreign students compared to the 2008 spring semester at The University of Texas at Austin, a preliminary report shows. Kristi D. Fisher, associate vice provost and director of the university’s Office of Information Management and Analysis, said the data are preliminary 12th class day numbers. The report shows total enrollment for the spring 2009 semester is 47,334, a decrease of 234 students (-0.5 percent) from spring 2008. Fisher said the decrease is primarily due to fewer continuing students at the undergraduate level. The number of Hispanic students for spring 2009 is 7,484, a 1.5 percent increase over spring 2008. African American student enrollment for spring 2009 is 2,093 (up 4.2 percent) and the foreign student total is 348 (up 1.5 percent). Enrollment decreased for white students to 25,757 (a 1.9 percent decrease), for American Indian students to 197 (a 4.8 percent decrease) and for Asian American students to 7,199 remained about the same, with only two fewer students than in spring 2008. Fisher said proportional representation on campus for the spring 2009 semester, based on the preliminary figures, includes: white students, 54.4 percent compared to 55.2 percent in spring 2008; American Indian students, 0.4 percent unchanged; African American students, 4.4 percent compared to 4.2 percent last year; Asian American students, 15.2 percent compared to 15.1 percent; Hispanic students, 15.8 percent compared to 15.5 percent; and foreign students, 9.0 percent compared to 8.8 percent. Students whose ethnicity was not known remained unchanged at 0.7 percent. The preliminary report also shows an increase in the proportion of female students on campus. Preliminary figures show that of the 47,334 students this spring, 51.1 percent are female (up 0.2 percent) and 48.9 percent are male (down 0.2 percent). The figures do not reflect a pattern since the proportion of male students had increased in spring 2008 compared to spring 2007 while the proportion of females had decreased. The proportion of students from Texas remained relatively stable at 80.8 percent in spring 2009 compared to 81.0 percent in spring 2008. Out-of-state students remained stable at 10.2 percent. New undergraduate enrollment is up by 41 students (4.9 percent) from spring 2008 totals, primarily due to an 11.5 percent increase in transfer enrollment. Fisher said there was a decrease of 41 students (-34.7 percent) in first-time freshman enrollment. She said the number of undergraduate continuing students decreased by 215 (-0.6 percent) and re-entering students decreased by 9 students (-1.1 percent). Graduate enrollment (including special professional) decreased by 51 students (-0.4 percent) and new graduate student enrollment increased by 16 students (7.3 percent, excluding special professional). There was a 14-student (-0.1 percent) decrease in continuing graduate students (excluding special professional) and a 10-student (9.9 percent) increase in re-entering students (excluding special professional).